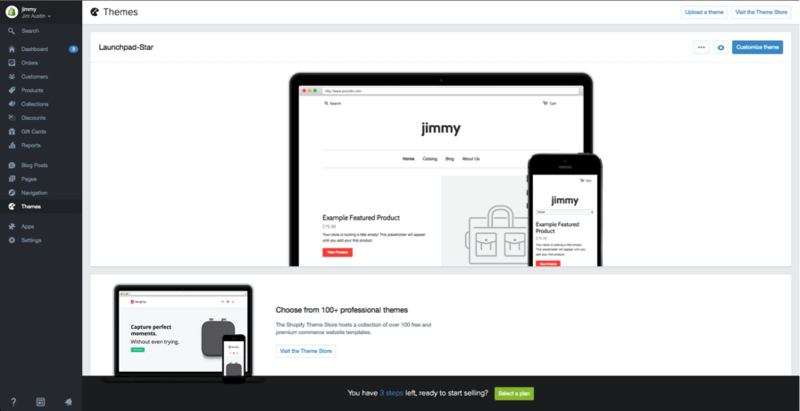 Shopify is a subscription to a software service that offers you to create a website and use their shopping cart solution to sell, ship and manage your products. Using their service, you can get an access to easy to use admin panel where you can add products, process orders and enter store data. For a monthly subscription of $29/mo you are able to build a full functional online store that you can use to sell digital or physical goods. Shopify also offers limited free trial. If you want to create an online store using Shopify, you’ve come to the right place. 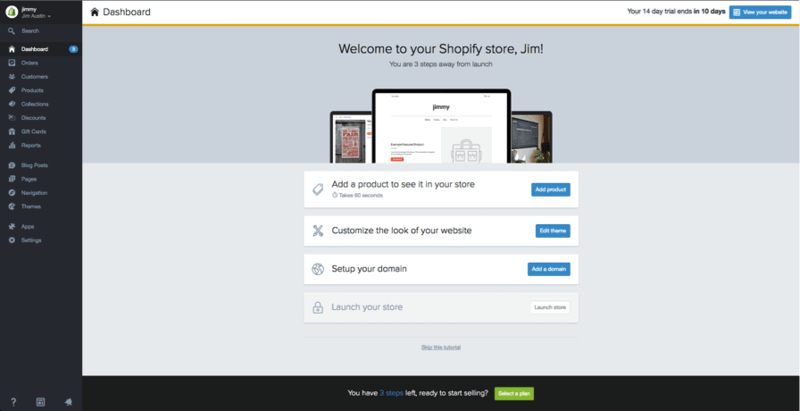 In this guide, I’ll show you how to use Shopify so you can launch your online store as soon as possible. Full disclosure: I earn a commission if you end up purchasing Shopify through my referral links in this guide. This helps me to keep WebsiteSetup up and running and up-to-date. Thanks for your support. Enter the required details and click the ‘Start free trial’ button. After this initial screen, you’ll be asked for a few more details, including your name, address, country and a contact number. Log into Shopify and visit the Shopify Theme Store at themes.shopify.com. You’ll find over 70 theme variations to choose from, including a good selection of free ones. 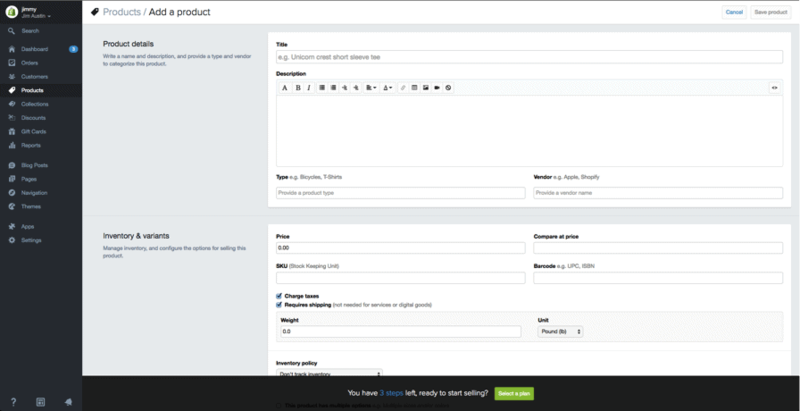 You also could find Shopify themes on other Marketplaces, like TemplateMonster one. Just choose, category, features to pick your theme. On your admin screen, select ‘Themes’ from the left navigation menu. On this page you will see your live theme in a box at the top, in the top right corner of that box will be two buttons. The first one is of three dots, which gives you some basic settings changes. One of these allows you to make a duplicate of the theme. We highly recommend you do this in case you make some changes you don’t like, you can delete the duplicate and start again. Navigating the bar on the left select ‘Products’. You will then see a blue ‘Add a product’ button in the top right corner of the page. Use the following screen to add as much detail as needed about your products. Especially look at those that will help with SEO such as name, description and URL. Include as many details as possible to help inform the customers about your items. To get your site live you’ll need a domain name. You have two choices. Firstly you can buy a domain from Shopify and it will be added to your store automatically. 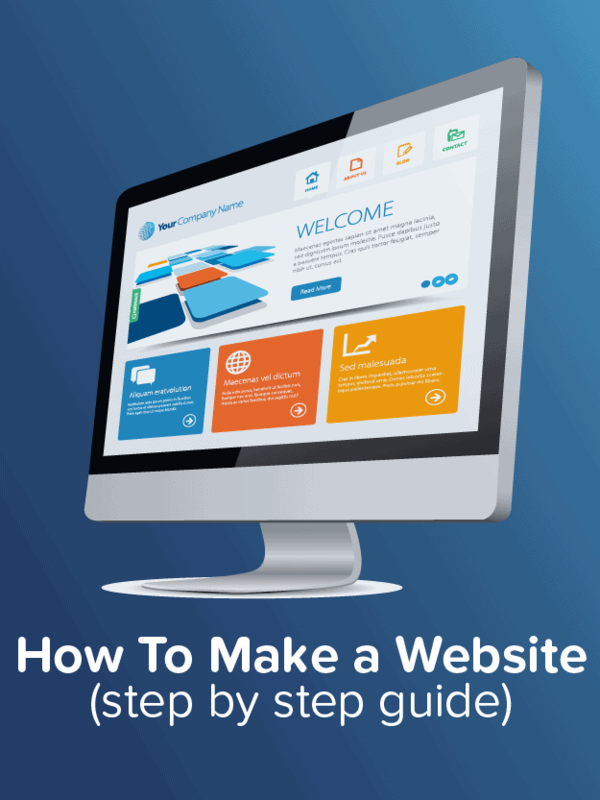 This saves you time, especially if you have no knowledge about hosting a website. These domains typically cost $9-$14 USD per year. Your second option is to purchase a domain from a third party such as GoDaddy. These domains start from $10.00 USD a year. The downside is that you’ll have to redirect the DNS records yourself which can seem daunting at first. In the Shopify admin, on the left navigation go to Settings and then Domains and add your domain name using the ‘Add an existing domain’ button. Congratulations, Your New Shopify Store is Ready! You can also use WooCommerce to start your online store. It’s a little cheaper but requires a steeper learning curve. Either way, it can be a great alternative. For more detailed review between the two, read this – Shopify vs. WordPress (WooCommerce) Furthermore, here you can find other ecommerce sites that allow you to create an online store. Can I shop on Shopify without setting up a store? Does shopify store, pack and ship the products? Does shopify market the products for you? How do you gain website traffic using shopify? How does Shopify use other selling platforms like amazon to market your online store? What is the membership fee entail every month? What is the difference from creating your own domain & website with a yearly service fee of just $25 a year like wix ? What is shopify doing for me as a business owner besides assisting me to create and pay a monthly fee for my website? Shopify is just a platform that gives you the tools to create a website for your online store, you’d have to organize your own storage and shipping as well as do your own marketing. As for the difference between it and Wix: Shopify is entirely focused on the online store aspect and as such has more features and better support for it, whereas Wix is a general website builder that can do online stores among other things. Also, if you want to do e-commerce with Wix, it would be at least $16.50 per month, not $25 a year. So I’m thinking of using Shopify as an online store for the warehouse business that I work at. The thing is, we would definitely need the website to be completely integrated with our system that we already use so that when we sell parts on our Shopify, it will take those products out of our inventory that we use for our system and vice versa. Is this possible if we decide to use Shopify? Hi – I set up my account for the 14 day free trial but then it went to this page is not available? Did I do something wrong? Can anyone regardless of what part of the world they are from start an online store using Shopify, or are some regions of the world restricted? I want to start a dropshipping business, but this is all foreign to me it seems the more research I do the more confused I get. With shopify’s free themes can you change the picture in the background? Certainly! All the images you see in themes are just placeholders and are meant to be replaced by your own pictures. 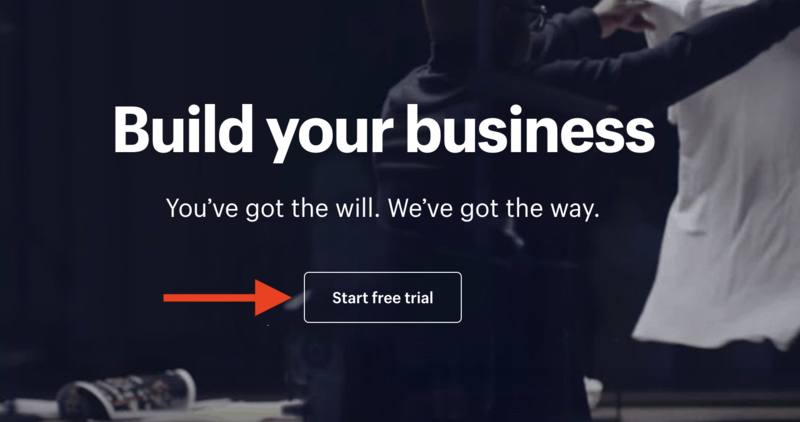 You can use their free trial for 14 days, but otherwise Shopify’s cheapest plan starts from $29/mo. I am selling on Etsy and I understand why people buy there, they are protected in many ways by that big platform. They know they will get the item they bought, they know they will easily replace the wrong item they got. As a seller I have obligation to satisfy each customer. So my first question is related to my previous writing. Do people use to buy from “untrusted” and “not verified” sellers? Who stands behind the buyers, who protects them, how would they be sure they will not be cheated? The second question is about visitor and potential buyers. Well I am not good in social media at all, so I have no Facebook pages, no friends I don’t know in person, no Instagram, no followers. So my second question is related to that. Am I supposed to bring visitors myself? If so, that kind of stores are not for me. Can my store be visible on Google if my SEO is fine, so I don’t need to attract visitors (it would take years of hard work to create some pages or accounts to collect followers)? I hope I was clear enough and thank you in advance. It’s true big platforms feel more secure, but independent ones are far from lawless. Consumer protection laws still apply to online stores and it’s also possible to report stores directly to Shopify if they’re misbehaving in any way. With regards to social media, it’s still advisable to set up profiles for your business because it’s another way to reach potential new customers and to promote your site, even if your personal profile doesn’t have a lot of followers. There’s no downside. We have a small hand made jewelry business and we want to start selling on Instagram. What would you suggest us, Shopify or something else? I am seriously thinking about opening an online store. Can you advise of all the fees to do so with shopify and dropshipping as well. Also when a customer makes a payment, will it go directly into my account? The good thing with Dropshipping is that the costs are much lower, essentially you only need to pay for your Shopify plan (plus any optional add-ons you want to get) and the fee to the wholesale supplier you’ll be using. And yes, the payments will go to your account directly. I have started a 14 day trial and feel I am going ok, the issue I have is photos of my products, I am not a photographer and not very literate in photo shop etc..
Can you please give me some basics on how to take good photos? All the ones I have taken have been on white backgrounds but they are either too big (bits chopped off) or way to small. My 14 days free trial is ending soon. But i ‘ve not set up my shop on Shopify and not really try out on Shopify. Can i re-register another 14 days free trial under another store name? Sure, but you’ll have to register a completely new account I think. My website is almost ready to launch on Shopify, but when I go to my real website and then want to order and pay for a product I get a notification with the following sentence: ‘The connection is not private’. With this problem, people are never going to trust my website. I have no idea how I can solve this. Could you help me, please? This sounds like a problem with your store’s SSL certificate, I’d advise contacting Shopify support – they can definitely help you with issues like this. Which theme on Shopify would be best for products that need a lot of education such as medical information? Also outside of graphics how much would the site cost all together up and running? Is it easy to contact it with your quick books account? Robert, I must say that’s a really comprehensive article for Shopify. thanks! There will be database for each customer’s record i.e. if some customer signed up his/her data will be stored in Shopify database or do I need to create one. And how should I link my database with website builder of Shopify. Hi Shivanagi, the database aspect of your site will be created and handled automatically by Shopify – you don’t have to do anything manually there. I have question: What about optimization of Shopfiy store? I read somewhere ready to use ecommerce platform is difficult in optimizing as we dont have control over files, we dont get FTP so not possible to update robots file. You’re right. Optimizing Shopify is much more limited that for example WooCommerce + WordPress. Shopify provides access to the stores’ files by the admin and the database via the API, but Shopify systems are not accessible via ftp for security and data integrity. I would like to do a website in which I can sell clothes and do custom printing clothes as well. Customers can choose to buy my clothes or they can choose photo, letter, etc to print on blank clothes. My plan is to get shopify store to start and get developer to customise it. Do you think Shopify is good choice or else ? Hello. I just stumbled upon info about Shopify a few days ago and i am trying to read about it. I’m wondering if somebody in Africa can use shopify to do business as well. thanks. 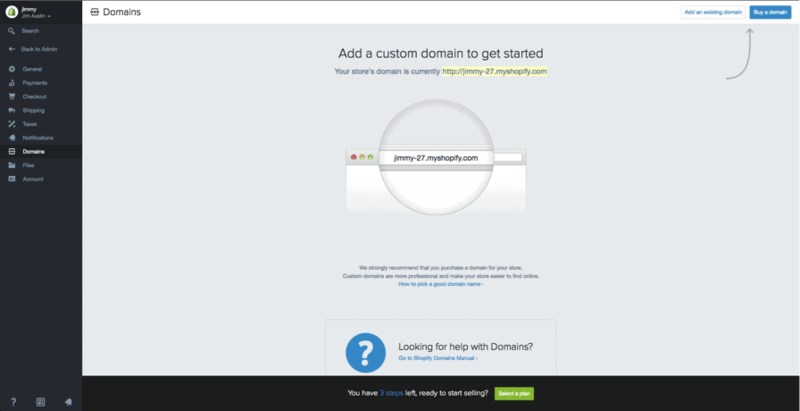 Prior to reading your Beginners’s Guide To Shopify Store, I got a domain from GoDaddy. Now, I want to start my Shopify Store all about clothings and apparels. Can I use my other Domain to start another online store and still do my Shopify Store at the same time? Is there a need for me to apply for an EIN Number before doing online marketing? You can use your existing domain name which you bought from GoDaddy on Shopify as well. You’ll just need to point your domain nameservers towards GoDaddy domain (use their support to figure that out). EIN number is not needed for online marketing (unless you’re starting to generate bigger income). Hello, I must commend your brief and precise guide. My challenge is, how can I use shopify to build an amazon affiliate website/blog (for product review with product link, comment section and live chat. Again, I need a responsive site that is desktop and mobile friendly. The comment/review section should be moderated. Any tips on how to achieve these with shopify? Please advise accordingly with possible hints. Hi Robert.Thanks for explaining the process of building an online store using Shopify. I am facing an issue with my client’s FB Pixel. My client’s site http://www.stepone.life has the FB pixel installed, however the pixel is not firing correctly on the product pages, it fires twice and I think it has something to do with the variant IDs in the URLs. Client is using the Paralax theme. I wanted some advice, I am looking to set up an online store selling my handmade jewellery and wondered what you can suggest would be best for me , I would most likely have approx 100 pieces for customers to view . Can you tell me if shopify would include all SEO/SSL/THE DOMAIN/AND HOSTING? This is a very informative article. I’ve been using Woocommerce for sometime and love it, but one of my client’s asked me if they should go with shopify. While researching, I chanced upon your article and from the looks of it, shopify seems a much faster/simpler alternative. The tradeoff, I guess is customizability. I’ve also been meaning to explore the ‘sell on facebook’ feature of shopify – seems quite useful. I’m ready to convert my clunky, broken old website to a shopify site. But I’m drowning amongst all the template options and variations. I’ve created a checklist of things I need but even so, it’s daunting. My pictures are very good (i use a full frame camera) but not professional level, my blogs are strong. I’m looking at Retina, Pacific, Icon, Minimal, Responsive, Symmetry and District at the moment. Once I get past those I start getting overwhelmed and want to cry. I am looking to start selling some of my products/apparel online. The store that I use to print and embroider my apparel does not do drop shipping. This company has helped me design, digitalize, and create screens for shirt printout and hat embroidery.. If I go through shopify and select a drop shipping company to print and send my products. how do they receive the information for my design?. will I have to pay for another screen and embroidery layout just to use them? I have a Facebook page that started out as a place to show pictures of quilts and quilted items that I make. Now there is a place on this page to sell items that you make. I have inquiries to sell my items. It looks like I need a website to do this selling. I already have a Paypal site set up for Items I sell on EBay. Should I direct people to my EBay page or should I set up a website? It depends how Ebay is working for you. If you’re getting enough leads/sales than stick with it, but if you’re not satisfied, consider setting up your own store. hi, I’m looking to build business store web. shopify is my option, but I’m not sure which plan suits me more? I have about 50 products, mostly is gonna be lots of pictures. I don’t know if I want to start with shopify plan as beginner but most ppl don’t suggest basic plan ( because bandwidth )? First of all I want to thank for the all the inforation you’ve provided here. I want to sell my designs and logos online. So which way is the cheapest one to achieve that. Do you recommend wordpress to build site like that. Sorry, I have another question, do you recommend to use wordpress to build site for people as bussiness ( small sites) or I shold use hand coding to build them? WordPress should be sufficient for both of them. So if you are looking to sell around 10-15 products/ would WordPress be better? Does it still offer a checkout features and payment processing option like shopify? Also how can these be linked to something like outreach for bookkeeping/invoicing etc? I think so. Shopify is more made for robust e-stores. If you have no more than 15 products, you’d be better off going with WordPress and using an e-commerce plugin. Let me know if that helps. Just found your site and it is GREAT! I have a quick question. I’m trying to help my wife set-up an website/online store for a long time brick and mortar business she owns. We want both the website and shopping function, would like to use invoicing through square as the primary means of payment, and she will have a couple hundred (or more) product options with pictures. Each item will have a secondary option for customization. Should we use WordPress or Shopify? I heard that you are able to dropship on Shopify. I wanted to opening a dropship store online. Could I also use eBay and Amazon to dropship from? First of all, thank you so much for all the help you’re providing for the newbies our here. I own an outdoor media company. We print banner ads and billboards for customers. our customers mostly place bulk orders and we print ads in varying sizes (no standard sizes). I’m unable to create a store with the option where the size of the print required is specified by the customer himself. Consequently my bill is always per squarefoot Another problem is that I require the customer to upload the file which needs to printed on the banner. I’m not able to provide these two options. I have tried using many different websites that help creating an online store.But I’ve had no success. Do I need to be able to use the back-end if I have to upload these specific options on my website? Is there any other sites which I could try that would allow me to freely customize my products page? Can I sell E-books on this site? I had a question, I am trying to build a website for product delivery. Sort of like choosing a pizza, paying for it and then setting up for delivery. Do you suggest WordPress + Shopify? First of all I would like to thank you for the information. Your step by step direction are easy to follow. I have a small embroidery business, at this point was just a way to generate a little extra money but has so much more potential. If I set up my on-line store can I limit my customers to Paypal? Yes you can 🙂 I know many people who ONLY take PayPal payments and that’s not a problem at all. Between WordPress + Woocommerce and, Shopify, which would you recommend for selling downloadable tutorials as well as eBooks. So if I am going to sell jewelry and want a website do I use WordPress AND shopify or just one of them? I was going to do my domain name on bluehost then use WordPress but can I sell on there or do I need shopify instead? I think WordPress + WooCommerce would do the trick. No need to go with Shopify. Does the shopify handle with all the php and the back ending stuff? I mean, can use wordpress and/or shopify just to handle the css and html to me? Thank you for your time and considaration. WP and Shopify are pretty similar to each other. You’ll be able to tweak the code by yourself from the back end (if needed). Do you have any tips for getting more traffic to Shopify shop? I just created it, now trying to figure out how to get more visitors. Hi Robert. Does WordPress or Shopify have any fees while using their platform? Thinking of creating an ecommerce like website for fun. WordPress is completely free. Shopify charges monthly. i want to create a store on shopify but i don’t have a personal products, but i will import items from other markets (ebay, amazon, aliexpress). how can i shipping product to Customers? there are some shopify’s apps help me to dropshipp products? I don’t know about specific APPs, but I think you can do it manually at first (dropshipping). Yes, There are a lots of app for dropshipping. You can use oberlo. If it’s consulting business then WordPress is probably easier choice for setting up a business model like this. I want to build a professional looking website featuring my coaching and public speaking practice. I will have a “Services” section with one1one online coaching sessions, public speaking events, and a few ebooks that I will sell (in the future I am planning to add more products like online trainings etc). What website builder do you suggest? Should I go for wordpress or shopify? As well, would you mind telling me what do you think about other website builders? I really want it to look very professional, I don’t care about the price too much. Great questions. If you only have few services/coaching then WordPress is probably a way to go. If you’re dealing with more than 50 products – Shopify might be a better solution. I’m just now starting a website. I came here because I thought that after I got the domain I was good to go. Silly Me. I have a blog…. however, I want to have a store on my wordpress site…. or website…. can I do this with shopify? or do I need to look for a wordpress plugin? If you want a really large shop with tons of items, go with Shopify. If you want to sell 10 – 30 items, go with WordPress. Shopify is better for larger ecommerce sites while WordPress is better for smaller ones. I want to establish my online Jewellery selling website but as a starter I want it for free. Kindly let me know the best possible options for this purpose. I have a question, sorry if it sounds dumb.. I am new at this … I am starting an online boutique store I was trying to see what would be a better option for me to use shopify or wordpress? thanks so much for your sites- very informative. sort of complex, I am noticing as I try to build a site myself. Which site would you recommend? Do you think I could do it myself or I should hire someone? How much would it cost? We are planning to open an online store for a range of clothing/designer stuffs. We want to launch an e-commerce website which shall enable the visitors to shop while they browse. Which should be a preferred option, Shopify or WordPress? Shopify would be a better option, but WordPress is more tweakable. I guess if you’re just starting out then go with Shopify – you can always move onto another platform (like WordPress) if needed. Hi Robert: have you used WooCommerce? What do you make of it? I’ve used it recently and was quiet impressed with it, so I’m wondering why you’re not even mentioning it. Many thanks. I haven’t used WooCommerce, but it’s a great alternative (WordPress + WooCommerce) for Shopify. I might write a blog post about it in the near future. Thanks for letting me know :). Found the answer in the same post! Sorry, lot of info in one day… I should download a plugin for WordPress and create and online store 🙂 Thank you anyway, let´s see now if I´m able to do all this by myself! Which is better for my vision, WordPress or Shopify? I will be starting a website that has blog posts, hair advice, hair consultations, video tutorials, all the while selling hair products and t shirts. Looking forward to your response. WordPress seems a bit better option as it suits well for content, blog posts, videos, images etc. Shopify isn’t that good for this kind of stuff – it’s mostly for selling things. Which website would you recommend for affiliate marketing?Shopify or WordPress?I am planning to make a niche affiliate website with good from Amazon mostly. We are a team of nutritionists. And we want to open a website for online nutrition consultation/nutrition counselling/diet planning. Its going to be a paid service. We plan to give diet plans, do skype calling for nutrition counselling and even write articles for viewers to browse through. What would you suggest for this? You seem to have a solid plan for a website. I’d start off with WordPress, though. It seems you don’t have much products to sell besides a diet plan and Skype consultation. If you are planning to write articles/blog posts too then WordPress seems to be best fit. Hi Robert, I checked the list of gateways and If I want to setup an online store in Colombia (south America) which one can I use? . This country is not on the list? Please advise. I’m more than sure that they will help you. You forgot to mention Opencart. But probably not that good as Shopify, though. I just had a question… after the website is set up when people buy products how does the business owner get paid? Is that an easy thing to understand and setup or does it require a link with ones bank account? Also, Are there ways to link quickbooks to this type of websites? You can set up “PayPal” payments link or Quickbooks too. Shopify also has its own built-in payment processors that you should make thing really easy. If you get confused a bit, feel free to get in touch with Shopify support chat – they have always been really helpful.